Many treatment plants throughout the country have been surprised to find ammonia in their water. Ammonia exists naturally in a significant number of groundwater aquifers and is present in water reclamation plant effluent. Ammonia reacts with chlorine disinfectants, increasing disinfection doses and can cause objectionable off-taste and odors . Ammonia can also accelerate corrosion of residential, commercial and industrial copper plumbing and cooling systems. This corrosion can raise copper concentrations at water reclamation plants, and if released to rivers and lakes at elevated levels, can be toxic to aquatic life. An economical and innovative way to treat ammonia and other related contaminants is through a biological treatment process. Instead of using chemicals, naturally occurring biology can oxidize contaminants such as ammonia, iron, manganese and organics that can then be removed by filtration. 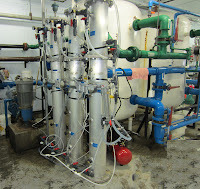 Biofiltration is applied by controlling air or pure oxygen introduction into a raw water stream prior to filtration. This is done in order to create a good environment for biofilm growth. The biofilm consists of a broad spectrum of microbes that oxidize contaminants under conditions controlled specifically for each. Because chemicals are not required for oxidation, as in most water treatment processes, the operational cost of treatment is minimal. Tonka’s biofiltration process consists of self-contained pressure filters that can treat water from the well all the way to elevated storage without breaking pressure. One or two steps of biological treatment will be needed, depending on the levels of iron, manganese and ammonia that are present. In a two-step biological treatment process, well water enters the first biological treatment step, where a small amount of oxygen is added permitting removal of iron and manganese. When the water flows through a media iron biofilter, dissolved iron and manganese are assimilated by naturally occurring benign organisms that preferentially assimilate them. This first stage of treatment occurs rapidly and operates at much higher loading rates than conventional iron filters. In the ammonia biological treatment step, naturally occurring benign organisms convert ammonia to nitrate. Because the conversion of ammonia to nitrate generates no waste, the ammonia treatment step requires backwash only as often as necessary to remove excess biological growth. 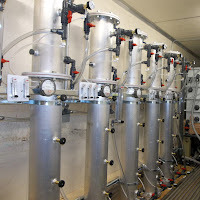 With only the use of water, air, filter media and time, the biological process can occur in the pressure vessel and reduce or eliminate the need for additional chemicals for final treatment. Most conventional treatment plants use chlorine or permanganate during the pretreatment process to oxidize iron, manganese, ammonia and other contaminants. Far less chlorine is needed when the biological process is used. Because biofilters are designed with a monomedia, they can be backwashed using Tonka’s Simul-Wash™ process without a need for restratification. In early 2012, Tonka developed a biological treatment pilot in Saskatchewan, Canada. The pilot involved testing three different support media for biofiltration. Three biofilters were set up for each train to remove iron, ammonia and manganese with aeration provided for each biofilter. The biofilter effluents were combined for treatment with a nanofiltration membrane system and a calcite contactor for water stabilization. The treated water from the piloted iron biofilters was consistently below the EPA secondary standard. After two months of operation, the ammonia concentration in the treated water was relatively consistent at less than 0.5 mg/L. These results are encouraging, especially considering the cold water conditions in Canada where the July water temperature has averaged 4.5 degrees Celsius. A water treatment facility in Minnesota is field testing a pilot system using Tonka’s two step biofilter process. Following start-up, the iron biofilter developed a healthy biomass and consistently produced effluent below the EPA secondary standard within three weeks. The ammonia biofilters removed more than 50% of the influent ammonia, with Tonka’s best biofilter design removing 75-95%. The results of both of these pilot systems demonstrate the potential of one and two step biological processes as viable treatment options for plants throughout the country. These new options make it possible to remove contaminants with significantly lower chemical consumption while reducing backwash frequency.